This post was originally published in November of 2017, and has been updated with more information and resources, including two burn test videos. When we talk about plastic and fire resistance, most people conjure up images of melting plastic in a campfire or bending plastic spoons with a lighter. While many plastics don’t stand up well to heat and fire (namely polypropylene and polyethylene), it’s not true of all thermoplastics. Specifically, chlorinated polyvinyl chloride (CPVC) is engineered to limit flammability and smoke production. In fact, many applications that specify CPVC piping because of its heat, pressure and corrosion resistance capabilities do so because it also satisfies strict regulations around flame and smoke resistance. But what qualities should you look for in a thermoplastic piping system to ensure it satisfies your application’s fire resistance requirements? There are several factors to consider when referencing CPVC’s fire resistance. The burn test video below provides a quick overview of key CPVC traits that contribute to its exceptional fire performance. Flash ignition temperature is the lowest temperature at which sufficient combustible gas can be ignited by a small external flame. CPVC’s flash ignition temperature is 900°F (482°C), making it far less susceptible to ignition than other thermoplastic materials. A material’s burning resistance is measured using Limiting Oxygen Index (LOI), which is the percentage of oxygen needed in the surrounding atmosphere to sustain a flame. Corzan® CPVC’s LOI is 60%. For reference, the Earth’s atmosphere is made up of 21% oxygen. Because of this, the instant a flame is extinguished from around the pipe, the material self extinguishes and burning stops. Conversely, once lit, polyethylene (PE) and polypropylene (PP) will continue to burn. Flame spread resistance is an important property because keeping flames contained helps firefighters or extinguishing systems more quickly put out blazes, limiting property and equipment damage. Corzan CPVC’s flammability is tested in accordance with UL 94, which determines the flammability of plastic materials used in components and parts of finished products. Specifically, this test measures a material’s resistance to burning, dripping, glow emission and burn through. Corzan CPVC has achieved the highest vertical burn rating available within the scope of the tests: V0. As with flame, confining the spread of smoke to one area limits potential smoke damage to property. This is especially important in cleanrooms, where particulates can contaminate equipment and products. During burning, CPVC will offgas and generate some smoke, but thanks to the engineering of the Corzan polymer and compound, the amount of smoke is limited. In addition, the moment the flame is removed from the pipe, the material self extinguishes and stops any smoke production. Extreme heat is capable of starting a fire if the proper fuel and oxygen are present. While firewalls are designed to stop the spread of smoke and flame through a building, they cannot stop heat transferred through the piping material. Metal piping has a high thermal conductivity, and transfers heat very well. In rare circumstances, heat from a fire in one room has the potential to cause a fire in an adjacent room by transferring extreme heat through the piping. Conversely, CPVC has a low thermal conductivity, limiting the transference of heat through firewalls. It’s worth noting that when working with highly flammable materials or if you’re concerned about flammability, metal piping can stand up to heat better than CPVC. 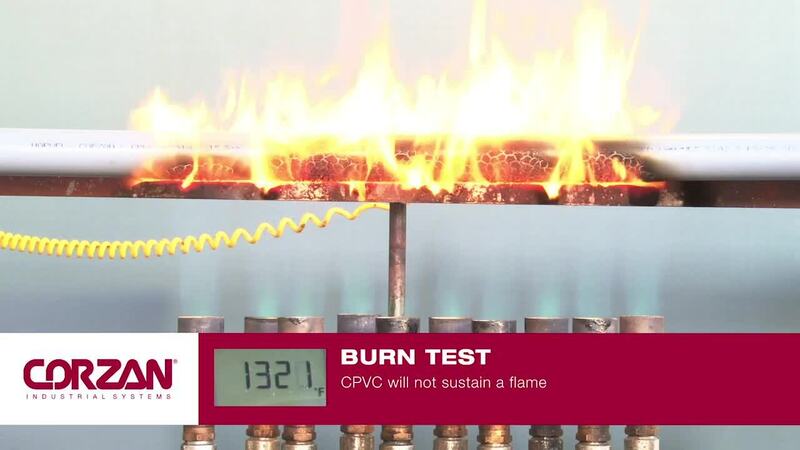 While CPVC limits burning after flame removal, it will still burn and eventually fail at a certain point before a metal system will. If you have questions, please set up a call with our engineering support team. For semiconductor applications and other facilities with cleanrooms, piping material fire and smoke resistance is a primary concern. In many cases, the products and equipment in these cleanroom areas are of high value, and the spread of flame and smoke contamination can result in high replacement costs. FM Global, an international property insurance and loss prevention engineering company, insures a number of these types of facilities. To limit their liability, they have developed FM Approvals, which in part test property loss prevention products and services, certifying that they meet rigorous loss prevention standards. To be insured by FM Global, cleanroom construction materials must satisfy FM Approval 4910. This standard tests a material’s combustibility and release of contaminates. Corzan CPVC satisfies this standard. Do You Have Additional Questions About CPVC and Fire Resistance? Talk with our product and engineering experts about your specific needs. They can answer any questions about CPVC’s qualities, recommended usage, and installation specifics.